Background and Objective : The objective of this study was to compare bacterial leakage using streptococcus mutans through gutta-percha and a thermoplastic synthetic polymer based root canal filling material (Resilon) using two filling techniques. Materials and Methods : A total of 90 single-rooted extracted human teeth were subjected for the study. Teeth were divided into 6 groups of 10 and 3 control groups of 10 teeth each. All the samples were decoronated and the coronal surfaces of the roots were prepared perpendicular to the long axis of the root with a high-speed handpiece and a multipurpose bur using air water spray. The length of all the roots was prepared approximately 16 mm from the coronal surface to the apex of the root. Roots were filled using lateral and vertical condensation techniques with gutta-percha and AH26 sealer (Group 1 and 2) or with gutta-percha and epiphany sealer (Group 3 and 4). Group 5 and 6 were filled with Resilon and epiphany sealer using the lateral and vertical condensation techniques. A split chamber microbial leakage model was used in which S. mutans placed in the upper chamber could reach the lower chamber only through the filled root canal. Group 7 and 8 (positive control) were filled with Resilon and gutta-percha without sealer and tested with bacteria, whereas Group 7 (negative control) was sealed with wax to test the seal between the chambers. Data were analyzed using Kruskal-Wallis test and Mann-Whitney U test. Results : All positive groups (Group 7 and 8) showed leakage within 1 hour of the start of the study (100%), whereas none of the negative control (Group 9) leaked. The roots obturated with Resilon and epiphany (Group 5 and 6) showed minimal leakage, i.e., each with 6 leakages, which was significantly less than gutta-percha (Group 1-4), in which approximately 80% of specimens with either sealer or techniques leaked. Kruskal-Wallis test showed statistical significance when all groups were compared (P<0.05). Mann-Whitney U test compared the respective groups and found Resilon groups superior to gutta-percha groups (P<0.05). Interpretation and Conclusion : This study demonstrated that the new polymer-based Resilon and epiphany sealer using two obturating techniques, i.e., lateral as well as vertical condensation found to be significantly better than the gutta-percha. Keywords: Epiphany, lateral condensation, Resilon, Streptococcus mutans, vertical condensation. Recent study has shown that when using the fiberfill obutrator, a resin fiber post with 5-8 mm of gutta-percha apically and a resin-bonding sealer, there was a 50% improvement in the prevention of bacterial leakage compared with the standard gutta-percha technique. This study suggested that a resin core root canal filling that could bond to the root canal walls is desirable. The purpose of this study was to examine the resistance of bacterial penetration between Resilon and gutta-percha during a 30-days period using two different obturating techniques. 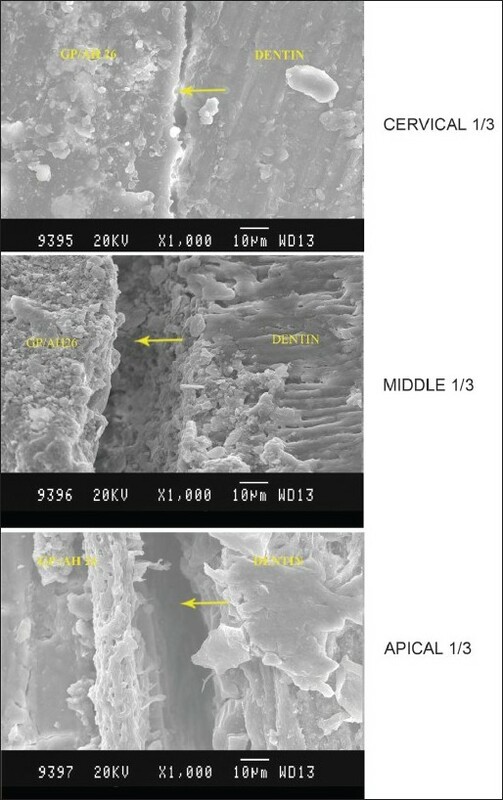 To compare bacterial leakage using Streptococcus mutans through gutta-percha and a thermoplastic synthetic polymer-based root canal filling material (Resilon) using two filling techniques. A total of 90 single-rooted extracted human teeth were subjected for the study. The teeth were stored in 2% thymol solution until use. The teeth were immersed in 5% sodium hypochlorite for approximately 15 minutes to remove organic material from the root structure. All the samples were decoronated and the coronal surfaces of the roots were prepared perpendicular to the long axis of the root with a high-speed handpiece and a straight fissure bur using air water spray. The length of all the roots was prepared approximately 16 mm from the coronal surface to the apex of the root. The working length was established with size 15 k-file (Dentsply maillefer, Tulsa, OK), 0.5-1 mm short of the minor foramen. The 15 size k-file was passed through the apical foramen of the canal before and after instrumentation to ensure patency. A total of 15 ml of 1.25% sodium hypochlorite was used for the irrigation during instrumentation; 5 ml of 17% EDTA rinses was used during and after instrumentation to remove the smear layer. The instrumentation was performed using profile 0.04% taper nickel titanium rotary instruments to size 35 up to the working length. The root canals were dried with sterile paper points before filling. Lateral condensation was performed in Group 1 (35 size, 4% gutta-percha, and AH26 sealer), G roup 3 (35 size, 4% gutta-percha, and epiphany sealer), Group 5 (35 size, 4% Resilon cones, and epiphany sealer). Vertical condensation was performed in Group 2 (35 size, 4% gutta-percha, and AH26 sealer), Group 4 (35 size, 4% gutta-percha, with epiphany sealer), and Group 6 (35 size, 4% Resilon, and epiphany sealer). A back fill with E and Q plus was performed using gutta-percha in Group 2, Group 4, and back fill was performed in Group 6 using Resilon. After obturation, the excess gutta-percha was removed with the hot instrument. Sticky wax was softened over open flame and painted over the entire root surface to seal it except the apical 2 mm and coronal orifice, which were left free of sticky wax. Dispense 2 to 3 drops of epiphany primer into a mixing well provided by the manufacturer. Fill the root canal space with the primer using a paper point. Use dry paper points to absorb excess primer. Dispense the sealer onto a mixing pad. If desired, adjust the viscosity of the sealer with epiphany thinning liquid. Apply sealer to the walls of the canal using master cone coated with sealer. Then roots were filled with either gutta-percha or Resilon points using either lateral condensation or vertical condensation techniques. Group 7: Positive control obturated with gutta-percha without sealer. Roots were filled with gutta-percha without sealer. Sticky wax covered the root surface as in Group 1. Group 8 : Positive control obturated with Resilon without sealer. Roots were filled with Resilon but without sealer. Sticky wax covered the root surface as in Group 1. Group 9: Negative control obturated with gutta-percha and Resilon without sealer. Sticky wax completely covered the surface of the root as well as the canal orifice coronally. All the teeth were stored in dampened gauze and enclosed in sealed tubes and kept in incubator for 14 days at 37°C to allow the sealer to set. The microbial leakage model consisted of an upper chamber and a lower chamber as described by Torabinejad et al. The upper chamber consist of 15 ml centrifugal tube. A hole was prepared at the bottom of the centrifugal tubes. The tooth was inserted into the tube and gently pushed through the opening until approximately one-half of it protruded through the tube. The space between the tube and the tooth was then sealed with sticky wax. Approximately 4 mm of root remained in the upper chamber. The upper chamber consist of 10 ml of WC broth (Wilkins-Chalgrens broth), which was inserted into the lower chamber consisting of 20 ml clear vial. Basal broth with phenol red indicator to which 2% added sucrose was placed in the vial. S. mutans (MTCC497) was grown in 10 ml of WC broth during 24 hours. The bacteria were identified using selective media and morphology, i.e., gram stained on colonies harvested from MSB (mitis/salivaris/bacitracin) agar plate. After 48 hours, S. mutans was added to 10 ml WC broth adjusting the optical density to 0.2OD 660nm. A total of 0.2 ml of the adjusted bacterial suspension was added to the centrifugal tube containing 10 ml of WC broth. On every second day, 9 ml of broth was removed from the centrifugal tubes and replaced with fresh broth. The centrifugal cap was replaced to prevent evaporation and contamination. The specimens were placed in an incubator at 35°C. Specimens were checked for a change in color of the ph indicator from red to yellow, every 24 hours during a period of 30 days, which indicated a positive result (metabolism as acid production). At completion of study, two Resilon and two gutta-percha specimens were randomly chosen. Each specimen was longitudinally sectioned so that dentin-filling interface could be obtained. They were mounted onto a scanning electron microscope specimen stub and coated with a gold palladium film. Specimens were viewed under scanning electron microscope. Digital images were obtained [Figure 1],[Figure 2]. The results were statistically analyzed using Kruskal-Wallis test and Mann-Whitney U test. The mean, median, maximum and minimum days, number of specimen leaked, and percentage of each group leaked is summarized in [Table 1]. The comparison of leakage between each tested groups and related information in terms of mean, standard deviation, median, and range is presented in [Table 2]. Mann-Whitney U test compared the respective groups and the Resilon groups were found to be superior to the gutta-percha groups with respect to the number and rate that the specimens in each group leaked (p<0.05), which means gutta-percha groups took less number of days for the leakage when compared with Resilon groups and also the number of gutta-percha specimen which showed that leakage were more when compared with Resilon groups. There was no statistically significant difference in leakage between Resilon groups. One of the most vital steps in endodontic therapy is obturation (or) obliteration of the pulp space. Ideal obturation aims to achieve a three-dimensional hermetic seal that will prevent periapical percolation, resist reinfection, and create a favorable biological environment to enable tissue healing. Gutta-percha is a material that is being used from many decades to fill the root canal. It contains zinc oxide (59-75%) as filler, gutta-percha (19-22%) as matrix, with a remaining small percentage a combination of various waxes, coloring agents, and antioxidants. But even by the most technically proficient operator, obturation with gutta-percha will not result in a seal that is dependable during long term. In fact, as stated earlier, the coronal restoration is more likely the reason for success during the long term than the gutta-percha fill. Few authors argue that gutta-percha should be replaced by a material that would better seal the root canal. In this study, S. mutans is used to test the leakage through the root canal system. S. mutans is a facultative bacterium, which is one of the predominant microbes in failed, previously treated root canals. So this bacterium seems relevant to clinical practice. There are various in vitro studies conducted that showed that gutta-percha fillings leak at a rapid rate. , Thus it would be advantageous to replace the gutta-percha with an obturating material that prevents leakage at all levels of the root canal system. Resilon, a thermoplastic synthetic polymer-based root canal obturating material, has been developed, which has the same handling properties as that of gutta-percha. It is based on polymer of polyester. It contains bioactive glass, bismuth oxychloride, and barium sulfate. The overall filler content is approximately 65% by weight. A good sealer should be biocompatible and well tolerated by the periradicular tissue. Ideally, further directions should focus on materials that penetrate the patent dentinal tubules, bind intimately to both organic and inorganic phases of dentin, neutralize or destroy microorganisms and their products, predictably induce a cemental regenerative response, and strengthen the root system. The delivery system of such materials requires ease of placement with a rapid and thorough set once placed in the canal system. Epiphany sealer is one such material introduced by Pentron Clinical Technologies, which has all the properties of ideal sealer mentioned above. The bond strength of smear layer to the underlying dentin is weak, approximately 5 MPa. This cannot withstand the shrinkage associated with curing of resins. The resin pull the smear layer from the dentin and provide an avenue for microleakage. In this study, 17% EDTA is used during and after the instrumentation to remove the smear layer and decrease coronal leakage. In addition to 17% EDTA, epiphany primer was applied to the dentin walls of the root canals that were to be filled with Resilon. Epiphany primer is self-etch primer that contains sulfonic acid terminated functional manomer, HEMA, water, and polymerization initiator. The preparation of the dentin through these chemical agents may prevent shrinkage of the resin filling away from the dentinal wall and aid in sealing the roots filled with Resilon. These results are in agreement with the previous study. The Group 5 (roots filled with Resilon and epiphany sealer using lateral condensation) and Group 6 (roots filled with Resilon and epiphany sealer using warm vertical condensation) showed less leakage and statistically significant difference when compared with Group 1 (roots filled with gutta-percha and AH26 sealer using lateral condensation), Group 2 (roots filled with gutta-percha and AH26 sealer using warm vertical condensation), Group 3 (roots filled with gutta-percha and epiphany sealer using lateral condensation), and Group 4 (roots filled with gutta-percha and epiphany sealer using warm vertical condensation). These results are in agreement with previous following studies. d) To check whether sealer is critical for the seal provided by Resilon obturating system, two positive control groups were used. In one group, 10 specimens were filled with gutta-percha without sealer and in other group 10 specimens were filled with Resilon without sealer. Both of these groups without sealer leaked within 24 hours. This showed that as with gutta-percha, the sealer is critical for the seal provided by the Resilon material. To check the seal between upper chamber (centrifugal tube) and lower chamber (vial), negative control group (Group 9) was used. None of the specimens showed leakage in this group. The findings of this study when evaluated by scanning electron microscopy showed the similar findings. This is in agreement with previous study. Resilon, a polymer-based root canal obturating material is found to be superior when compared to gutta-percha in resisting microbial leakage. Both lateral condensation as well as vertical condensation were found to be good for obturating Resilon. However additional in vivo and in vitro tests and clinical trial are desirable in order to elucidate the effectiveness of the new polymer based root canal obturating material (Resilon). I would like to thank Dr. Dhanyakumar, N.M. (Professor, Department of Conservative Dentistry and Endodontics, College of Dental Sciences, Davangere 577004) for providing constant guidance during my study. I would like to thank Mr. Bruce Finnigan, Marketing Manager, Pentron Clinical Technologies, Wallingford, CT 06492, USA, for sponsoring Resilon kit. 1. West JD, Roane JB. Cleaning and shaping the root canal system. In: Cohen S, Burns RC, editors. Chapter-8 in pathways of the pulp. 7th ed. St. Louis: Mosby Inc; 1998. p. 203-357. 2. Moller AJ, Fabricius L, Dahlen G, Ohman AE, Heyden G. Influence on periradicular tissues of indigenous oral bacteria and necrotic pulp tissues in monkeys. Scand J Dent Res 1981;89:475-84. 3. Bystrom A, Sundqvist G. The antibacterial effect of sodium hypochlorite and EDTA in 60 cases of endodontic therapy. Int Endod J 1985;18:35-40. 4. Ray HA, Trope M. Periapical status of endodontically treated teeth in relation to the technical quality of the root filling and the coronal restoration. Int Endod J 1995;28:12-8. 5. Shuping G, Ostravik D, Sigurdsson A, Trope M. Reduction of intracanal bacteria using nickel- titanium rotary instrumentation and various medications. J Endod 2000;26:751-5. 6. Torabinejad M, Ung B, Ketterring JD. In vitro bacterial penetration of coronally unsealed endodontically treated teeth. J Endod 1990;16:566-9. 7. Khayat A, Lee SJ, Torabinejad M. Human saliva penetration of coronally unsealed obturated root canals. J Endod 1993;19:458-61. 8. Shipper G, Trope M. In vitro microbial leakage of endodontically treated teeth using new and standard obturation techniques. J Endod 2004;30:154-8. 9. Shipper G, Orstavik D, Teixeira FB, Trope M. An evaluation of microbial leakage in roots filled with a thermoplastic synthetic polymer-based root canal filling material (Resilon). J Endod 2004;30:342-7. 10. Molander A, Reit C, Dahlen G, Kvist T. Microbiological status of root-filled teeth with apical periodontitis. Int Endod J 1998;31:1-7. 11. Nielsen BA, Beeler WJ, Vy C, Baumgartner JC. Setting times of Resilon and other sealers in aerobic and anaerobic environments. J Endod 2006;32:130-2. 12. Key JE, Rahemtulla FG, Eleazer PD. Cytotoxicity of a new root canal filling material on human gingival fibroblasts. J Endod 2006;32:756-8. 13. Jacobson HL, Xia T, Baumgartner JC, Marshall JG, Beeler WJ. Microbial leakage evaluation of the continuous wave of condensation. J Endod 2002;28:269-71. 14. Kaufmann RM. Resilon- Finally, an endodontic filling material for the 21st century? The endofiles-fax. Vol. 5. 2004. 15. de Oliveira DP, Barbizam JV, Trope M, Teixiera FB. Comparison between gutta-percha and Resilon removal using two different techniques in endodontic retreatment. J Endod 2006;32:362-4. 16. 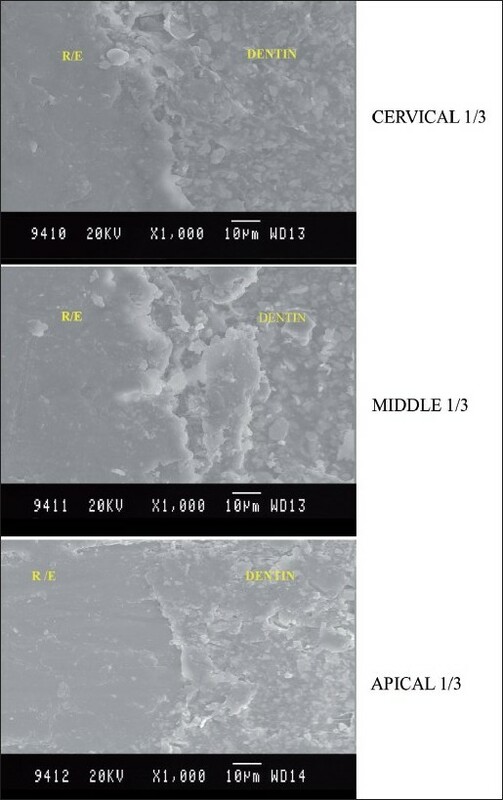 Ezzie E, Fleury A, Solomon E, Spears R, He J. Efficacy of retreatment techniques for a resin-based root canal obturation material. J Endod 2006;32:341-4. 17. Aptekar A, Ginnan K. Comparative analysis of microleakage and seal for 2 obturation materials: Resilon/Epiphany and gutta-percha. J Can Dent Assoc 2006;72:245. 18. Tunga U, Bodrumlu E. Assessment of the sealing ability of new root canal obturating material. J Endod 2006;32:876-8. 19. Mounce R, Glassman G. Bonded endodontic obturation: Another quantum leap forward for endodontics. Oral Health 2004; 16-22. 20. Nielsen BA, Baumgartner JC. Spreader penetration during lateral compaction of Resilon and Gutta-percha. J Endod 2006;32:52-4.